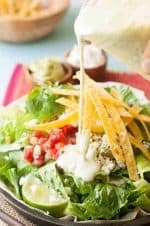 This healthy Cafe Rio gluten-free pork salad recipe with creamy tomatillo ranch dressing is a copycat Cafe Rio salad recipe with healthy, simple, homemade ingredients that are easy to make in the slow cooker and a favorite of my immediate family for large family gatherings. I love to eat at Cafe Rio. It’s not my favorite restaurant, but it’s relatively affordable and whenever a group of us are going out, we usually end up coming here because everyone can agree on it. Not all of you have the privilege of living near a Cafe Rio. But if you live by Chipotle, I’m told it’s sort of like that. The main thing I don’t like about Cafe Rio is that since I eat Clean most of the time if I eat their sweet pork, I feel awful. It tastes so good, but if you look at the copycat recipes for it, they use Coke and brown sugar. No wonder I feel bad after eating it! So, I played around with the ingredients and come up with this Cafe Rio Gluten-Free Pork Salad Recipe that’s so much healthier and (I think) better than Cafe Rio’s. Each individual part isn’t very hard, but all the time involved does add up. My dad is a traditional eater. He likes American and Italian food and that’s about it. My mom hates to cook. I think it’s really funny that pretty much all of their children enjoy a wide variety of food and enjoy cooking. Seem off subject? Well, it’s hard to come up with a meal to eat for family gatherings that everyone will eat. 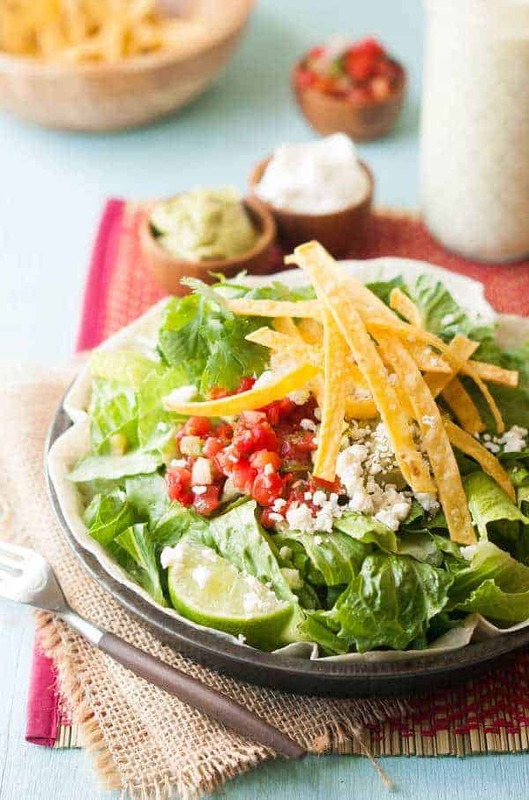 There are about 30 of us when we’re all there and we’ve found that this Cafe Rio Gluten-Free Pork Salad Recipe is our go-to meal. The only person who doesn’t like it is my dad. BUT, because he can pick and choose which foods he eats, he comes up with a dish that he may not love, but he doesn’t complain about. Same goes for the children. Some of them, all they eat is a tortilla and cheese, but at least it’s something – and it’s not hot dogs. And we can easily split up the different parts of the salad so it’s hardly any work for each individual. In fact, as much as I enjoy going to Cafe Rio, I think my wallet does not. So my solution you might ask. I created this healthy Cafe Rio Gluten-Free Pork Salad Recipe with creamy tomatillo ranch dressing that I can make at home. This is great because then I can enjoy one of my favorite meals but having more control what goes into it! The dressing is made from scratch with no ranch mix but tastes just like the real thing! It may be a touch thinner, but still so yummy. No ranch packet, Coke or brown sugar .. Just good, healthy and simple ingredients. Make Cafe Rio at home. If Pork Loin is very large, cut into two or three pieces. Place the pork loin in a crock pot and turn on to high heat. Place all other ingredients in a blender and puree until very smooth. Pour over the pork in the crock pot and cook for 5-6 hours, or until tender and shreds easily with a fork. Shred and toss well in sauce. Keep warm until ready to serve. Place the buttermilk, mayo, tomatillos, garlic, and lime juice in a blender. Puree until very smooth. Add the remaining ingredients to the blender and puree just until the herbs are finely chopped. Place a tortilla on a plate or in a bowl. Place desired amount of sweet pork on the tortilla. 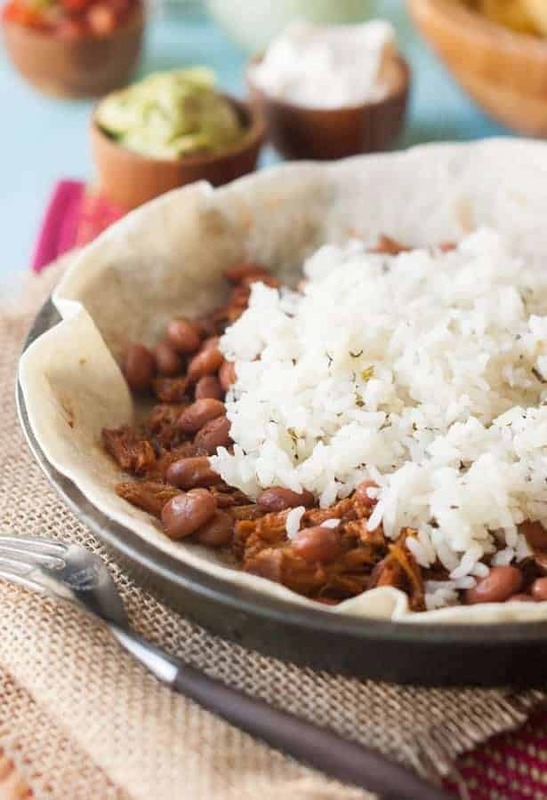 Top the pork with with a scoop of rice and beans. Top rice and beans with desired amount of lettuce. Garnish with a scoop of pico de gallo, sour cream, guacamole, a handful of tortilla strips and crumbled cotija cheese. Top with tomatillo ranch dressing. I’m so happy I came across this recipe! I’m from SLC and grew up eating the pork salads at Cafe Rio! Now I live out of state and far away from any Cafe Rio. I can’t wait to try the recipe!! Glad to help. 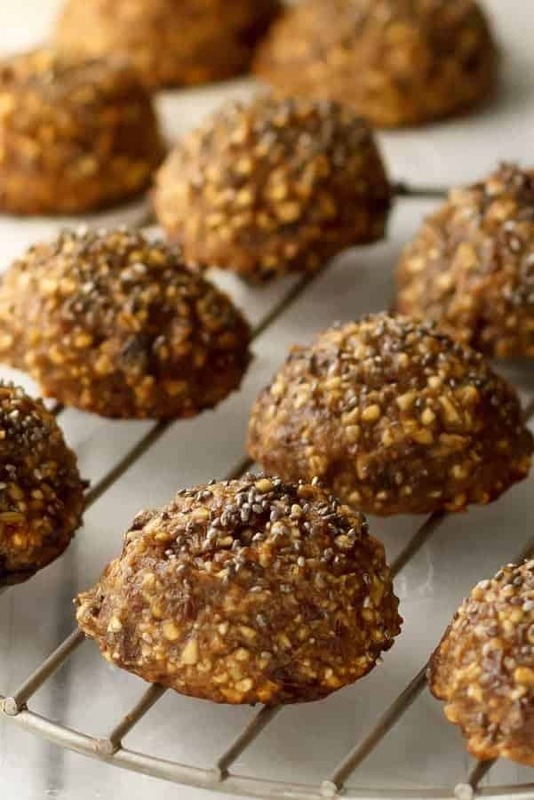 I would love to know if you’ve tried the recipe and what you thought. . . This looks wonderful, but I’m a bit confused. In the write up of the recipe its says that the pork is sweetened with honey and maple syrup, but when I look at the list of the ingredients I don’t see either of those ingredients listed. Am I missing something? I am sorry about that. I believe we changed the recipe a while back and missed updating the write up. Thanks for you letting us know. I updated the write up. “The pork in this recipe is made with a homemade enchilada sauce and both maple syrup and honey.” I don’t see any maple syrup or honey mentioned in any of the three recipes. Was it forgotten? This looks so good! I love Cafe Rio and wish we had one here in Texas. I am not sure about the tomatillos issue but you could give it a try. About the honey and syrup something got accidentally deleted or changed but we have gone through and fixed it. Thank you for letting us know! Let us know if it works out for you! This looks delightful! I have been trying to find some new salad recipes to add to my cook book! Also, I know my husband will be thrilled with some meat on top, especially pork! Thanks for the new recipe, can not wait to try it!! You are welcome! Let us know how it goes for you! Oh my, looks so amazing. So hungry now! YUM! I have pork out for tea tonight … this looks like it could be tonight’s dinner! I hope you like it, let us know if you enjoyed it! ohhh sounds yummy! We do a bbq pulled pork but I am not sure I would want that on a salad. I think this sweet port would be tasty on a bun or salad, I will have to make it just to double check! pinning 🙂 Thanks for linking with us at Snickerdoodle Sunday! This looks delicious! I would love to try it. Thanks for the great post! Thank you so much for hanging out with us and sharing your fabulous blog post on #PureBlogLove Link party! I’m very excited to be featuring you over at A Little Bird Told Me Link Party! The feature goes live at midnight EST. You’re recipe looks great. Cafe Rio is tasty I think you may have triggered a craving. I am so hungry now…this recipe looks amazing! 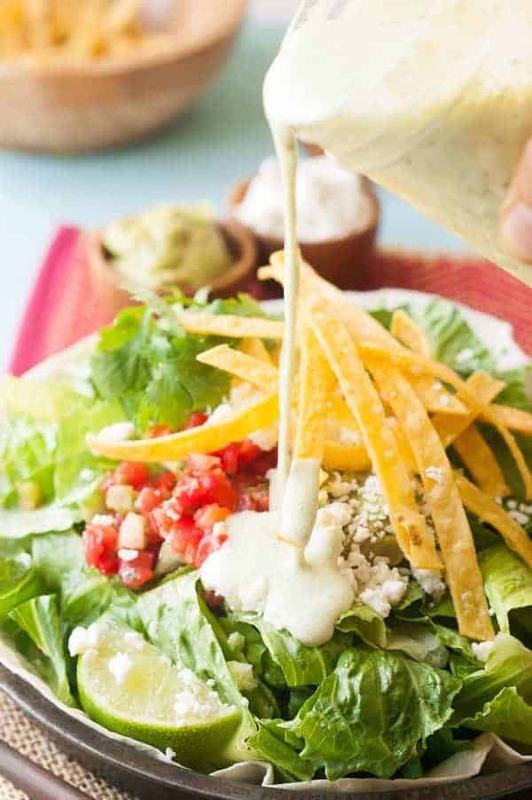 Your Creamy Tomatillo Ranch Dressing sounds delicious! Pinning to my Salads board. Stopping by from Foodie Friends Friday. Awesome thanks, we will take a look at it! Can’t wait to try this version. I love sweet pork! Thanks! You are welcome! I hope that you enjoy it, let me know what you think! So important to have good recipes to stay on track with a healthy diet! Thanks for this one, it looks so good! Yummy! I love Pork Salads and this looks divine! Thanks for sharing! PINNED! I love, love, love this kind of salad! Thanks for sharing.